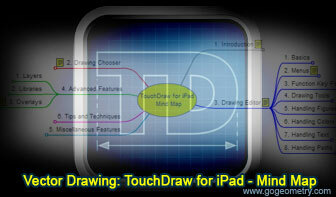 Vector Drawing: TouchDraw for iPad, Interactive Mind Map. Elearning. Interactive Mind Map based on TouchDraw for the iPad by By Elevenworks LLC. Source: elevenworks.com. TouchDraw is a full-featured vector drawing application for the iPad. Standard Features: Lines, Squares/Rectangles, Rounded Rectangles, Circles/Ellipses, Polygons, Path Tool, Freehand Tool, Image Tool, Text Tool, Grouping/Ungrouping, Locking/Unlocking, Rotation, Unlimited levels of zoom, Dynamic canvas size, Undo/Redo, Cut/Copy/Paste, Grid & Rulers, Ordering, Shadows, Line decorations , Layers, Printing - Support for printing to AirPrint enabled printers. Advanced Tools: Connectable graphs, Convert text to paths, Boolean Path Operations, Add, subtract, intersect or exclusion, Layers, Libraries, Overlays, VGA Adapter Support, Custom font support. Folders: Support to organize the drawings until nested folders. We are not limited to the single documents directory like other iPad apps. Importing: PNG, JPEG, GIF, BMP, TIFF, SVG, VDX (Visio XML Drawing Format), EMF (Enhanced Metafile), WMF (Windows Metafile). Exporting: Image (PNG), SVG (Scalable Vector Graphics), PDF, VDX (Microsoft Visio).